Some in the storm-ravaged Florida Panhandle are pondering whether they should have risked their lives by staying put. PANAMA CITY, Fla. — Gregg Ebersole trekked to the Panama City Marina from his devastated neighborhood on Thursday morning to find a miraculous sight: Nestled amid the twisted metal on the damaged dock was his boat, just as he had left it on a rack. "Everything is tossed around like it's a toy," said Ebersole, surveying the aftermath. "Mine is sitting there all nice and pretty." 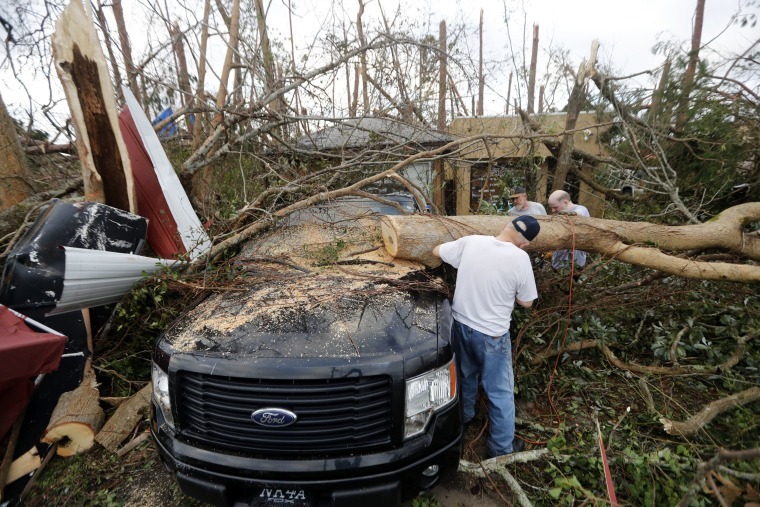 It was a small dose of comfort after Hurricane Michael thrashed the Florida Panhandle on Wednesday and blew apart much in its path. Ebersole's single-story brick home survived, but he said he was caught flat-footed by the report that Michael had intensified into a powerful Category 4 storm quickly as it guzzled warm water on its advance up the Gulf of Mexico. "If I knew it was going to be a Cat 4 with a direct hit, I never would have stayed," Ebersole said. "Two days ago, we were out boating in the sunshine. This snuck up on us so quick." He added that he had advice for those thinking of riding out such a violent storm: "Don't do it. Get out." Michael, a brute of a hurricane that brought a storm surge of up to 14 feet and ferocious 155-mph winds, became the first Category 4 to make landfall along the Florida Panhandle. At least two people, including an 11-year-old girl in Georgia, were killed. More than 850,000 customers remained without power Thursday morning in Florida and Georgia, where Michael, since downgraded to a tropical storm, was moving across on its way to the Carolinas. Michael has mangled almost everything to some degree: Hi-rise condos in Panama City Beach saw parts of their roofs peeled off. Trees snapped and fell on structures in Panama City, home to about 37,000 residents. And swaths of nearby Mexico Beach, a small town where the hurricane made landfall Wednesday afternoon, appeared leveled. One Facebook user who posted video from Panama City wrote that the damage "looks like a complete war zone ... Panama City will never be the same." Panama City resident Missy Theiss said she was going to remain in her home because she couldn't find a place that would take her and her five pets if they evacuated. On Thursday morning, with two trees lying lopsided on her roof and her backyard ravaged, she realized she made the wrong choice. "At this point, if I had to rewind, all the animals would be in the vehicle and we would have just been heading north," said Theiss, 54. After driving to her son's home in Panama City Beach, a tourist destination known for its emerald waters and white sands, she became emotional. "How something so beautiful can be turned into something so wicked and deadly is just amazing," she said. "I've never seen anything like it." FEMA Administrator Brock Long said search and rescue teams were continuing to comb through the debris, but getting to the hardest hit areas remained hazardous. An 80-mile stretch of Interstate 10, which weaves through the Panhandle, was also closed Thursday so crews could clear roads. Social media posts included surreal scenes of wreckage that residents had woken up to. Margie Duncan, 70, was alone with her two dogs when the hurricane bore down on Callaway, just to the east of Panama City. She said the strong winds — possibly tornadoes — clipped the patio off her home and ripped off a tarp covering her roof. "This was the strongest and harshest storm I'd ever seen," Duncan said. As the eyewall of Michael passed over, she said, she and her neighbors briefly went outside before taking cover again. She later spoke with her daughter, who said she was relieved that her mother came out unscathed. Duncan had an unusual outlook about her decision to stay put. "I'm so glad I remained," she said. "That's another thing on my bucket list: I sat through a Category 4 storm and I got to sit through the eye of it." Kerry Sanders reported from Panama City, and Erik Ortiz from New York.